Hatters Town striker Elliot Lee felt his side came through their final test of pre-season with ‘flying colours’ after beating Notts County 2-0 on Saturday. 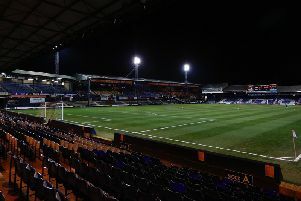 The forward, who scored the second goal after Jorge Grant had put Luton in front early in the second half, thought it had been a fine work out ahead of the big kick-off this weekend, when Town head to Portsmouth for the opening game of the League One campaign. We’ve come through it with flying colours, a great performance and a 2-0 win. Lee said: “I think it was a great way to end pre-season. “It’s been tough, but it’s been enjoyable for the boys and it was a tough encounter on Wednesday against Norwich. “Then it was another tough encounter today (Saturday), but I think it was a more realistic one we saw it as. Although Luton couldn’t break through in the first half, they always looked to be the dominant force without seriously testing visiting keeper Ross Fitzsimons. However, that was rectified after the break, with Lee doubling Town’s advantage from close range, adding: “I think we were a bit guilty of trying to score the perfect goal at times.